ALWAYS good advise. You even go the extra mile and carry your own water. Four paws up to you. You got it sussed. I make my peeps carry my water. Have a super Sunday. Yes, you are right Benny. Good Job Benny, what about some FOOD! Ha ha ha! It looks like you've got all the bases covered, Benny! Benny you are so funny!! if I go on a long walk I'm taking you as my water boy!! BOL!!! OMD, you are sooo funny Benny! Well I've usually got the first two covered on my walks, but not so much the third one. I see you travel prepared! Great advice...especially with warmer approaching. We don't carry bottles, though. You got it Benny, Great advice!! HECK SAKES... THAT is super advice fur a Long Walk or a Short One. Oh gosh- these are some wonderful words of wisdom! Very wise words, Benny! Have a wonderful walk! Great advice, Benny. AND then go home and take a long nap. 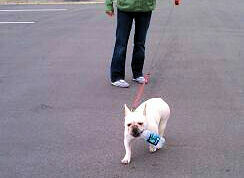 Benny you are one in a million...carrying your own bottle!! Love you! We always do...mostly the last 2! I can see that you're following your rules, Benny! I wonder if you can do all 3 -- all at one time ... stretch, hydrate, and urinate? That is GRREAT advice! I will keep it in mind for my next walk.